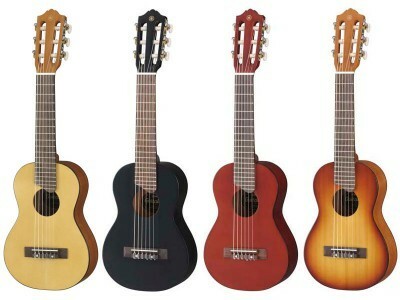 SUMMARY: The Yamaha GL1 Guitalele is a really interesting instrument. Like the name suggests, it is a combination of a guitar and a ukulele. It has the 6 strings of a standard guitar (ukuleles have 4 strings) and has the small size and the unique sound of a ukulele (although you can tune it to sound like a guitar). It is made by Yamaha, so you are getting the traditional quality Yamaha workmanship and great sound, but you are paying a very low price for it. Overall this instrument is incredible value for what you are getting. It is fun to play (especially for an adult), and is so small and compact that you can take it almost anywhere. PROS: The GL 1 is inexpensive, sounds amazing, it is very small so it is comfortable and easy for kids to play. It is also great quality for the price you are paying. This Guitalele would make a good transition instrument for a child who can already play the guitar and wants to learn ukulele or vice versa. CONS: Since it has nylon strings, you will need to spend the first week or so re-tuning the strings, most likely every time you play until they settle. It also has a wide neck, so if your child has tiny hands, they may find it hard to fit their hands around the neck and play comfortably. The headstock is a little big, but that doesn’t affect anything, it just looks different. The GL -1 is such a fun little instrument; I would recommend it to almost anyone. It is so versatile that it would be great as a beginner instrument or for a kid who knows how to play the ukulele and wants to move onto the guitar, or for a guitar player who wants to learn the uke. This guitalele could also suitable for lessons (although check with your teacher). Another very popular use for it is as a travel guitar by an adult or a teen. An advantage of learning on a guitalele is that it doesn’t have any of the “uncool” vibe that some people associate with classical style guitars, but you still get the advantage of the nylon strings that are a bit easier on kid’s fingers when they are learning to play. This is also a very durable instrument that can take a beating- which is a definite plus when talking about guitars for kids. You can tune it so it plays like a ukulele (with 2 extra strings) or like a guitar. The headstock and tuners are classical or uke style and once the strings have stretched, it will stay in tune quite nicely. The most important thing you need to know about the appearance of this Guitalele is that it is SMALL. It has a 17” string scale and is roughly ½ the size of a full-sized guitar. Its small size makes it super portable and very light so that kids will love the size. The other aspect of its size that is important to be aware of if you are shopping for a child is the width of the neck. The neck is a bit wider than a standard steel string acoustic, but is narrower than most classical models – at the nut, the neck width is 1 7/8″. Since the GL 1 has a short scale length, the frets are perhaps a bit closer together than on full sized guitars, this is beneficial for kids making it easier to play, but can be a problem for some adults who have large hands or fingers. It is available in the colors black, natural, persimmon brown and tobacco sunburst. The sound of this instrument is another big factor if you are considering buying this model. If you get the guitalele, you or your child will need to learn how to tune it to your kid’s preference, since it can be tuned to replicate a ukulele or a guitar or something in between. The recommended tuning is to an A instead of the standard E tuning of a full-sized guitar. It means anything you play on the guitalele is like playing on a full sized guitar with a capo on the 5th fret. To me, the standard tuning sounds much more like a ukulele than a guitar, although with a more pleasant, full sound. You will also need to remember that the strings will need time to stretch. After the strings stretch and settle, it holds the tune very well. Yamaha is known for the quality of their instruments, and the GL 1 is no exception. On the model that I have the finish is excellent, there are no sharp edges on the frets and no fret buzz. The neck is straight, and the action is low – which is a bonus for kids because it is more comfortable for them to play. For $100 this is a well-built, proper instrument (not a toy), that is very durable compared to some of the $40 ukuleles that are out there. I’ve had my guitalele for around 10 years and it has faced 10 years of abused and being banged around, but it still plays perfectly despite a few dents. If you get this for your kid, it will be durable enough that they can take it to school or to a friend’s house and it will be able to withstand a beating or whatever rough handling your child can put it though. It is usually a good idea to switch the strings out to something better quality. You also need to give the strings a couple of weeks to stretch. The neck may be a little wide for some children. If you want your kids to learn a pure guitar sound, then this won’t be the right instrument for you, since the tuning is a little different. The GL1 Guitalele is a very impressive little instrument for a very low price. The quality is top notch and lives up to Yamaha’s reputation. The small size makes it easy and comfortable for kids to play. The sound is also great for the size, it is more like a ukulele than a guitar, but it has good volume and projection. Highly recommended.